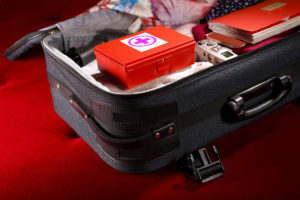 One of the most helpful items to have on hand while you travel is a first-aid kit – and it should be more than a box with bandages and antiseptic cream. While you can’t always prepare for unexpected illnesses that occur while you’re traveling, you can prepare for many of the common ones that may make a trip less enjoyable — or productive. There’s no time for a sick day when you’re traveling on business. And when you’re on vacation, you don’t want to let anything stand in the way of that special time. It’s important to check with your primary care doctor or a local travel clinic before you go on vacation. You might need a few vaccines that you weren’t aware of, for example. 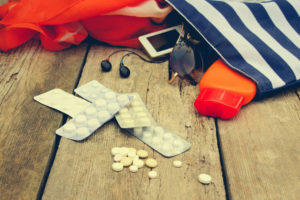 And, of course, if any family members traveling with you are currently taking any medications, it’s important to pack the right amount for the duration of your trip. Take along enough for a few days extra in case of unexpected travel delays. 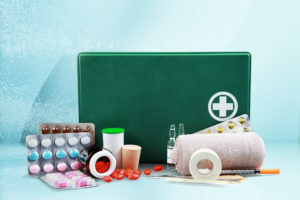 One of the most helpful items to have on hand while you travel is a first-aid kit – and it should be more than a box with bandages and antiseptic cream. Here, courtesy of family physician Neha Vyas, MD, is advice on what to keep in your travel first-aid kit. Most illnesses overseas are gastrointestinal-related so be sure to pack medicines to manage diarrhea and constipation, such as Loperamide, fiber and bismuth subsalicylate. These bright pink medicines will make your tongue and stools turn black for awhile, but this subsides when you stop the medicine. Your doctor also may prescribe an antibiotic that you can take if you develop travelers’ diarrhea. Make sure you understand how to take the medicine and when to start and stop it. If you experience diarrhea that won’t go away, signs of dehydration such as dizziness or an inability to keep fluids down, seek medical treatment abroad. These can help you should you come down with a respiratory tract illness that can range from a cold to allergies from weather changes. Over-the-counter motion sickness medicine for those who experience queasiness and plan to be out on the water. If you’ll be traveling to mountains and other elevated areas, prepare for altitude sickness by asking your doctor for prescription anti-nausea medicine. Traveling to a location with mosquitoes? Take medication to prevent malaria. This is usually prescribed by a doctor and needs to be started in advance of your trip. Should You Go on Vacation When Being Treated for Cancer?